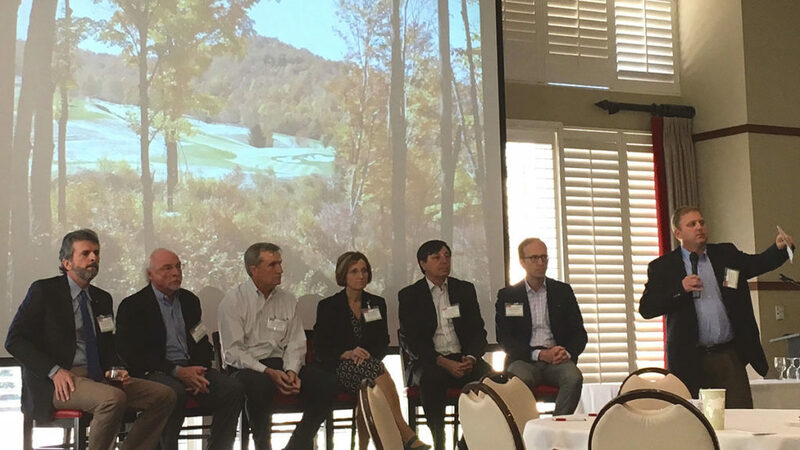 The Center for Turfgrass Environmental Research and Education’s 2017 Research Symposium, “Turf Trends for Changing Times,” held at the NC State University Club on December 14, welcomed over 125 attendees from different sectors of the turfgrass industry. As many or more attendees worldwide were able to participate via live stream. Plenary speakers included Dr. Bob Harriman, Vice President, The Scotts Miracle-Gro Company , Dr. Renee Keese, Biology Project Leader (R&D), BASF Corporation and Dr. Mark Schmidt, Manager Global University Relations, John Deere. The afternoon program included a second NC State University CENTERE updates session with presentations by graduate students and postdocs and also a graduate student poster competition. The winner of the poster competition was PhD student Ray McCauley for his poster Evaluation of sand topdressing on bermudagrass recovery post fraise mowing. Second place was shared by Patrick Maxwell’s Soil volumetric water content application affecting subsurface lateral herbicide movement and Xingwang Yu’s High-resolution genetic mapping and comparative genomic analysis in St. Augustinegrass. Here is the complete information about the symposium including speakers, abstracts and links to each presentation. The NC State University Turf Research Symposium was made possible by the generous support of Bayer. • Master Gardener(sm) Symposium "Backyard Gardening: Changing Times, Changing Conditions"